you turn on the car and when shifting from P to any forward speed, it took from 5 to 10 seconds to grab it, after that, then you had to rev up a little to "help" it to grab. BUT , when I mention "5-10 seconds to grab, in that time the car feels like it is on 3rd or 4th gear because if you rev it over 2k the car moves a little THEN it grabs the right gear (I am talking for starting from stand still). since 3 days ago, the transmission does not grab any of the low gear, if you go highways the cars behave very well, like nothing is wrong but if you stop and want to start to move, its like if the transmission were in 3rd or 4th. my mom has told me that also when decelerating, it feels some rough knocks (like downshifting but harder). What could it be what should I do what should I test? tomorrow (well.. within 9 hours) I am going to check the shift lock solenoid (the device that unlock the shift selector when you depress the brake pedal) which is not working properly. Does the power light flash 16 times at start up? Have you checked the TCU for codes? If there's no power light flashing on startup, I'm not sure you'll find anything, but it'd be good to check. How many miles are on the car? When's the last time you checked and changed the transmission fluid? To properly check the transmission fluid, warm up the transmission by driving several miles, park on a level surface, turn off all the accessories so the engine is at a normal idle, slowly cycle the gear selector from P to 1 and back to P. Leave the engine running and then check the transmission fluid against the "Hot" Full and Low marks. The fluid should be red/pink in color and not smell burnt. Does shift light indicator in the dash change from P to D or another gear when you move the gear selector? Last edited by maxdrive3 on Wed Oct 22, 2014 1:48 pm, edited 1 time in total. and 2 years ago it flashed 16 times (at the same time the car stalled, my mom told me that when parked at the mall, i asked her to record with its phone the power light then in home i count it and was 16 flashes. i have checked the codes (yesterday) following the "surrealmirage" steps and now the power light does not come on, like if everything is ok. The car has 159k miles on it. i did a fluy replacement yesterday i did it like "ericthecarguy" recommend me in its video (with oil pan removal and filter changed) WITHOUT the transmission treatment, only the oil. The fluid that came out of the vehicle was unoxigenated blood red and about the smell.. i am not sure if it smells burn. i finished the procedure at 11pm, i immediately turn it on, no leaks, but the problem was still there. I'm sorry to hear about the poor mechanic practices. Under normal conditions the power light is supposed to come on and stay on for a few seconds at startup, and then turn off. When it blinks 16 times at startup that is an indicator there is a code stored, and you need to pull the codes. When you following the procedure on my site to pull the codes from the transmission computer, did the power light blink indicating codes were stored? If you don't have any codes indicating a failure of an electrical component, I would suspect the problem could be something mechanical like the fluid pump or possibly a passage in the valve body being clogged. Unfortunately, something like that would more than likely require disassembly of at least the valve body for inspection. If the mechanics there are not trustworthy, then I don't think that's probably a good idea. My best suggestion would be to see if you can find a used transmission that is in ok condition and swap transmissions. Doing this work without the help of a lift can be quite challenging since the automatic transmissions are pretty heavy. I wish I had some more suggestions for you. I'm happy to continue to help if you want to continue to try and troubleshoot the problem. I think I followed the procedure wrong, I think I erase the code and now it looks like the pronlem is not happening right now and that's why the transmission shows there is no code. BUT the fact itself of no showing the power light on when startup is a problem itself then, because you say it MUST, then what would cause the power light not to come on at start up? an unpdate: yesterday, incredible I was able to get the same fluid "erickthecarguy" used, the lucas oil slid stopfluid, I pour it all and tried again, and no luck. I even take the car to the highway to see if maybe I could make any difference.. nothing at all. what can cause the power light not to come on after start? What was the code ? , If the TCM finds anything electricaly wrong, it will trigger a code . If any code is present ,the trans goes into failsafe mode . So, after you get a code, you need to fix it before you determine that the trans is no good. Makes sense ? You need to put a scanner on it and retreive the codes . If you can't comunicate with the TCM (Transmission Control Module) then you may have a bad TCM. I can conclude, the problem is the same, and the power light is not coming on after startup like you told me, which would suggest a commmunicationproblem wiith the transmission module. Can a Throttle position sensor trigger failsafe mode in the transmission? So, just to confirm what is going on. When you turn the key from the off position to the ON position (but don't start the car) does the power light illuminate? If not, then either the power light bulb is bad or the TCU may be bad or not getting power. I'd recommend verifying that the TCU has good power & grounds. You can try testing the terminals for power & ground with a multi meter. Below are links to the TCU I/O which will tell you which pins to test. I tested the transmission sensors like the service manual says, all, absolutely all the sensors are fine, they are very well in the middle of the acceptable normal range. 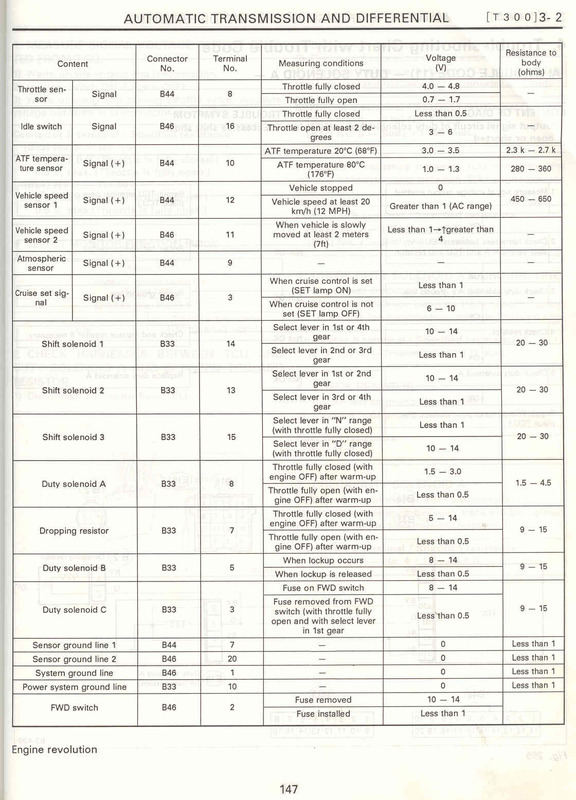 but the throttle position is bad, i did the test with the multimeter and the resistance between pin 2 and 3 was 8.8 instead 10-12, and the measure for the throttle closed was 8.8 instead 12 and for the throttle open was 0-1.74 instead 3-5.
regardiong the power and ground you recommend me to test.. could you please be little bit more detailed. for example, how do I test for power and ground? what do I hve to test, if power is going TO the TCU? or if power is coming OUT of the TCU in certain terminal? regarding the TCU, I remove it and open it, the circuitry looks pretty fine, no burn smell, no visible blown chip. I know you've emailed me, but to follow up on your questions; you need a multimeter to be able to test for voltage and check resistance. Based on your comment above, it sounds like you have one since you checked the resistance of the TPS. To check the power and grounds on the TCU, you need to put the multimeter in the "voltage" mode and around the 20v range if it does not have an auto range feature. Remove the TCU from the car. Take one end of the multimeter leads and touch a good chassis ground then take the other lead and touch connector B46 pin 14 of the TCU connector. Additionally, check connector B33 pin 1 and connector B44 pin 6. 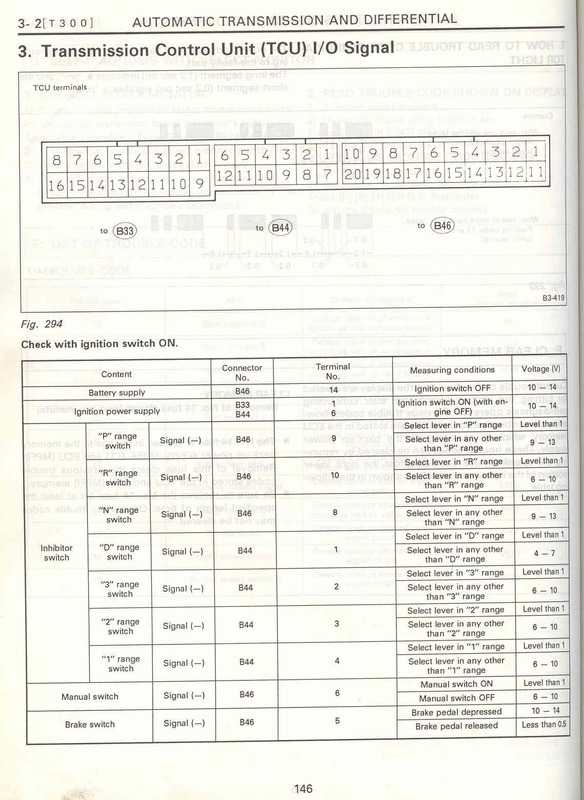 Pin 14 should have 12v on it whether the ignition is on or off. Pins 1 & 6 should have 12v on them when the ignition is in the ON position. Remember that the numbering on the above scans are labeled as if you're looking directly at the TCU. So when you look directly at the TCU chassis connectors the numbering will be mirrored. This thread has more info. To check the grounds you would want to put the multimeter into resistance mode and check the resistance from a good chassis ground to the following pins: Connector B44 pin 7, B46 pin 20, B46 pin 1, B33 pin 10.
your help is higtly appreciated!. first, I need to clear something.. you mentioned ECU.... did you mean TCU or ECU? or do I have to test the ECU too? do I have to disconnect the connector and to touch the connector at the end of the wire, the connector attached to the TCU itself, or with the connector plugged to the TCU the back side of the connector? Sorry about the confusion, yes I meant TCU. I've gone back and fixed my post. For checking power you can either disconnect the connector and to touch the connector at the end of the wire or with the connector plugged to the TCU the back side of the connector. For checking the ground wiring resistance/continuity you need to disconnect the connector and to touch the connector at the end of the wire. Let me know if this and my email is enough clarification or if you have additional questions. it was the TCM, I received the one I ordered from ebay yesterday. but before to install, I performed the ground and power test. I followed your steps and everything was ok , so no doubt. I proceed to install the new TCM and I all the problems were gone, the car shift even than before and down shift smoothly, may be the combination of the new quality oil, with the Lucas additive and finally the TCM... the car shift super smooth, under many circumstance it does not even fell when the shift is done. Ii want to give you the most sincere thank you Josh! You're very welcome and I'm glad the car is working good now! Hope you and all the other guys are fine! that i will ask for advice in another post. Guess what, the 93 Legacy has again the same exact problem. One thing to notice, the probelm came almost exactly each 4 years! i change the TCM in 2014, now we are in 2018 and i am having problems again. but what if the "mechanic" didnt chose the right trasmission for the TCM i have in the car? taking into accoutn that for the 90-94 legacys there are 30 different TCM! Then i did a research and BINGO. The transmission that was installed in 2010 (i entered the code in a web catalog) and i discovered it belong to a UKDM 1.6 Impreza. That is interesting about the timing around all this. Do you know what year the Impreza transmission came out of? Is it a similar year as your Legacy? As long as it's a similar year/generation it "should" be ok. However, it's possible that something with that transmission is different causing issues where if the transmission was using the original 1.6 Impreza TCU it might be ok.
No, i don't know the year of the impreza the transmision did came out. Today i have to pick up a new TCM i bought from ebay, so i will see what happen. which forum you recommend me for getting help fast? and all the problems gone.